Ahhhh, I am a Mashed Potato Champ for sure. For me, they are comfort food and a favorite. I use a Ricer which makes mashing very quick. It helps that I can peel potatoes like lightening! Still though, I prepare them probably around 3 times a month or so. Love your meal ideas and have tried several..thanks so much! My family loves mashed potatoes! I probably love them the most so we have them once a week at least. I guess I’ll take the time to make them because I want them. The other times we have potatoes I don’t peel them. It’s sure easy to fling potatoes under the guise of anonymity. Be baking powder (ironically a very efficient leaven)- rise above. ???? Awww they are one of my husband’s favorites! He’d be upset if I gave up on him :P To be fair though he’ll eat mashed potatoes with the skins still on so it’s not nearly as hard unless I want it to be. My daughter and I prefer it without the skins so if I’m feeling extra energetic that day I’ll peel them if not oh well. But like a previous poster pointed out you have pretty much three grown men to feed, plus another growing boy, and you just might want to eat something yourself ;) that’s a lot of food. If someone is feeding toddlers or young children they don’t eat nearly as much..Hugs we are all in different seasons, and sometimes those seasons last and that’s just life. It’s your life though not theirs. This is how my family gets mash potatoes. I peel and cut the potatoes in the morning leave them in a pot of water during the day and when it’s time I turn them on as I am getting the rest of meal ready by then there done and I used a hand mixer and mash away. We roast potatoes because they go in the oven at the same time as all the other veggies. Yep. Clearly commenters that don’t read your blog regularly! There’s all kinds of cooking/baking that are “easy” in theory. For me, I buy candied nuts. Yes, melting some sugar, adding a few spices, and tossing in nuts is super easy. But not when I have two toddlers underfoot – that “easy” can turn into a scorched pan and burnt sugar super fast. So I give myself grace and buy Planters pre-made sugared nuts. Salad is easy. But sometimes I go with the pre-bagged lettuce. Cutting cheese is easy. But when I”m make 10 sandwiches at once, I go for the pre-sliced stuff. Goodness. We all have to cut corners somewhere or we’d never be able to leave the kitchen! I make them often and I make a LOT at once. I use my 8 quart Instant Pot pressure cooker and I use organic yellow potatoes, no peeling. Just cut them, pressure them, drain them and mash them right in the same one pot. I also store any leftover mashed potatoes in that pot because it is stainless steel. The Instant Pot has changed my cooking, simplified it and streamlined it for me. If you’re making baked potatoes then you’re making individual mashed potatoes that the individual has to mash themselves. :))) Butter, salt, cheese, sour cream…all used in mashed potatoes as well as baked….only difference is you don’t have to make the mess and the individual makes them according to their preference. So you are actually doing everyone a favor…and it helps keep one less pot out of the sink. And if you use crock pot liners to make your baked potatoes (which I LOVE, by the way) you don’t have to clean the crock pot either. Rock on, you hard working mama! I’ve given up on them too unless it’s a special occasion and then, I do them in the crock pot. In this situation the labor involved is peeling and cubing……which is still a stain on my time. But I do love me some mashed potatoes! The struggle is real! Hey, if you are happy and you are feeding your family, you are doing great!!! My hubby loves mashed potatoes, but we don’t make them much because it does take more time. I love the simple ideas you share. Maybe one day I can join the simple meals. For now, I love what you share on the blog. Thank you so much. You do what is best for you and your family. No attack intended (and granted I have a small family), but I make mashed potatoes 5lbs at a time in my crockpot. Scrub the potatoes, don’t peel (better for you anyway), crockpot for ? (4 maybe) hours with a little bit of water or chicken broth. The mash/rice in the crockpot, add milk/cream, butter, salt. I freeze what is left over in meal-sized containers with a little milk or cream. Easier. I even do this for Thanksgiving (i.e., make the potatoes ahead of time). I also feel so frustrated about people not reading or researching but yet “sharing” stuff online! So much negativity, judgement and “advice” being given carelessly. I’m sorry for any hurt that’s been caused, Laura, but know that you are appreciated, needed and loved by so many. Ignore the rest. So mash or don’t mash….but definitely don’t bash!!! I quit making mashed potatoes years ago. I roast (unpeeled) or bake mine – preferably in the microwave. I’m with many of you: No mashed taters here—life’s too short! I can’t imagine anyone giving you grief over not making mashed potatoes…just “feed the people” as Stacy Meyers says, lol. Certainly if y’all like salad more than mashed potatoes then go for it. Its all real food! I personally would rather make mashed potatoes than a salad any day….all that peeling and chopping for a salad is so tedious to me. And I totally get the feeding big kids deal. We have 6 sons and 3 daughters. We’re down to only 3 teen boys at home, but they eat almost as much as 9 when they were all little. Bake those ‘taters and toss that salad…you go, girl! I totally get it, Laura! I don’t make mashed potatoes that often either because of the mess and time. It’s so much either to throw potatoes in the toaster oven to bake. And when I do make mashed potatoes, I just wash them really well, chunk them up with the skin on, and then boil them. And if it wasn’t for you showing how easy real food is, I would feel so much more guilt for not providing gourmet meals for my kids! Meat and fruit/veg, sometimes a carb. Done! My husband and I both do not eat a lot of sugar or carbs. And there’s always chips or bread and butter or something for the kids to eat if they need more. And cookies. They get their carbs, believe me. Anyway, love ya! It’s far easier for the person who cooks at home 2 to 3 times a week to make mashed potatoes every 9 dinners than it is for someone who cooks 3 meals a day. We’ve discovered cooking meat, and other things, in a sous vide. My husband works at home while I work out of the house. He uses the sous vide to make dinner 4 or 5 times a week. 3 to 4 hours for steak, and for chicken or fish, he can drop them in frozen when he leaves to pick out daughter up from school, come home and roast veggies, and we have dinner ready on time with minimal effort. Then we’ll eat fresh fruit after. We’re recently on a healthier eating plan, and it wouldn’t be nearly as easy without the sous vide. I’ve even lost 20 lbs since we started, and I feel amazing! Real for ftw. Ha! I’ve given up too! Well, maybe twice a year. I’m at the opposite end of parenting from you – 4 boys under the age of 5. 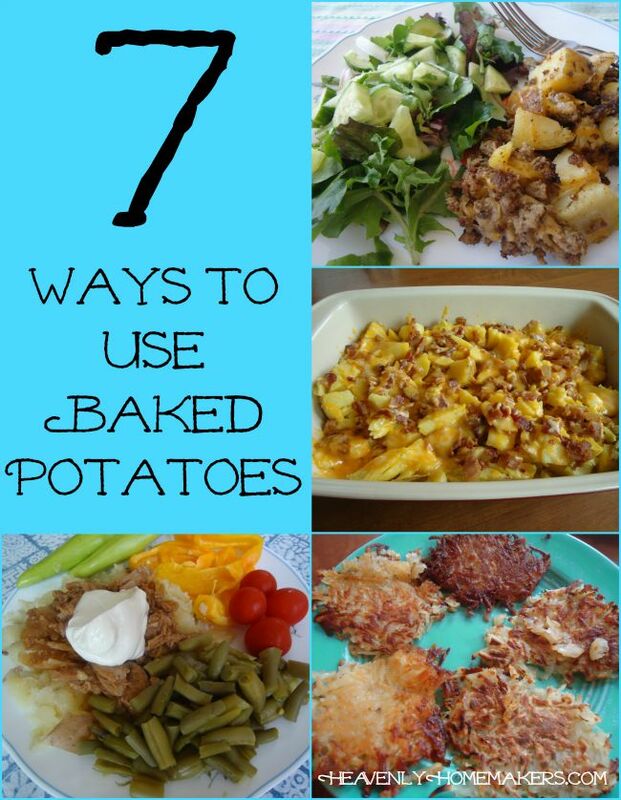 We like mashed potatoes well enough but I’ve found that we do just as well with baked potatoes. For me it isn’t the extra dirty dishes that I mind, but the attention. To cut, boil, mash takes more attention than I can be guaranteed to be able to give. 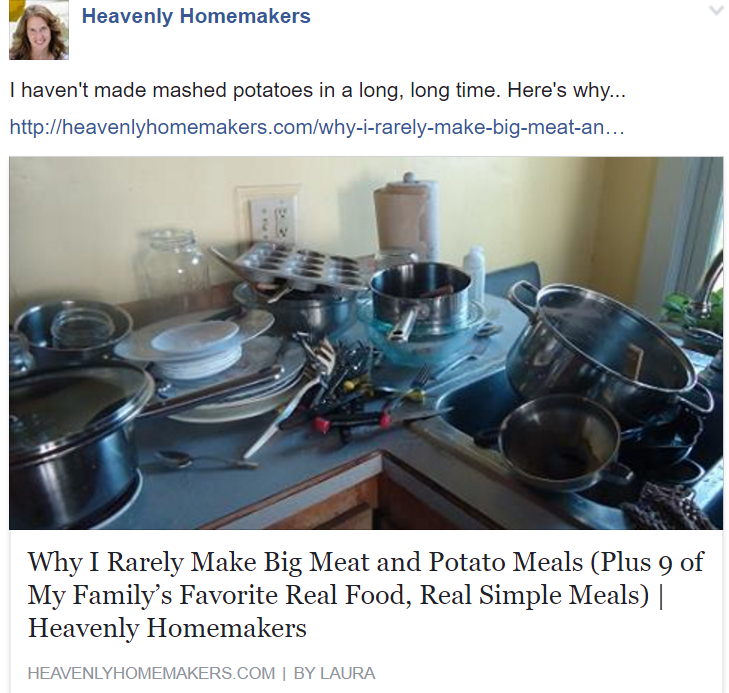 I absolutely loved that post because I have been crusading against mashed potatoes for years and everyone thinks I’m crazy! Whatever the opposite of bang for your buck is is where mashed potatoes live. Everyone will ooh and ahh over your roast that took two minutes but shrug over your irrationally labor intensive potatoes! There is (a lot) more to this rant, but no need! You get it! I’m not great at many things in the kitchen but this mama can do mashed potatoes!!! I make the biggest batch I can, skins on if my dad or I grew the spuds. Cook till they almost mash themselves (you don’t have to cover with water bc the ones on top will steam), stir occasionally. Drain, mash, and add copious amounts of some of the following: butter, milk, cream, sour cream, salt, cream cheese, shredded cheese, homemade ranch mix (or dill and garlic powder), and crumbled bacon if you want (butter, salt, some dairy, and ranch required here). I freeze in 2-4 cup packages for my little family. Thaw in a sink of water and I think they’re best baked to reheat. That reminds me, I need to make a new batch! Mine are not that good….and I also get potato everywhere.